Many business owners have heard of SBA funding and how the government backs the loan. However, from our communication with thousands of business owners and first-hand experience with the largest SBA lenders, we found most don’t understand what it takes to get an SBA loan and how the process really works. So, we have decided to break down the top SBA lenders and give you an opportunity to explore your options. In general, the government does not actually fund your business and there is a pretty extensive underwriting process. It does hold true even in lending – good things take time. That is why an SBA loan can be the right choice for your business. As a business owner making the decision to start the journey for an SBA loan the first thing to ask yourself is, “where do I start and who do I apply with”? As a company, we can help with the preliminary review but at the end of the day as a business, you will have to go through one of the key players in the SBA space. Who are they? 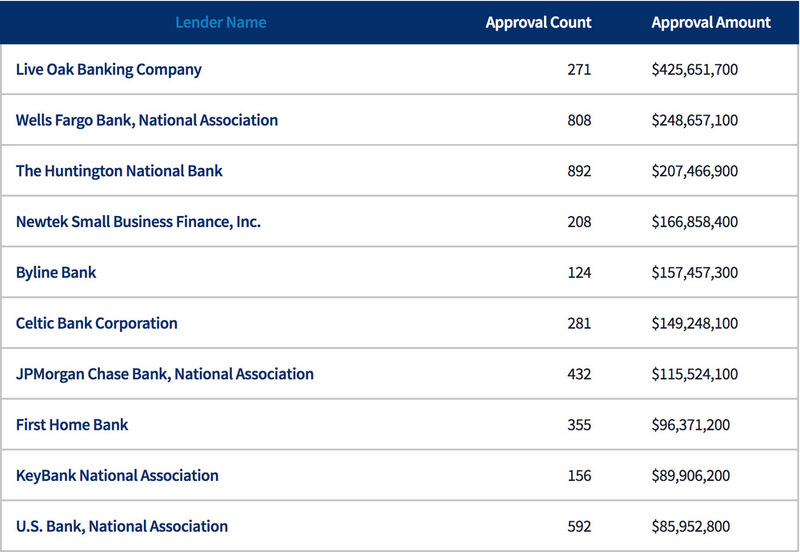 We put together a list of the largest top 10 SBA lenders below. This is ranked by volume of approval, Total amounts approved along with the average loan amount. This information is current as of December 31st, 2018 and can be found on the SBA site directly. What does it take to get approved by any of the Top 10 SBA Lenders? Every institution has its own in-house guidelines. Every bank is different and has its own policies and leniencies depending on specialty. This also varies depending on what stage of the business is in its maturity. 1. Tax liens – Since these types of business loans are government backed most SBA’s are automatically declined based on tax liens. There are however some circumstances where you can pay off the tax lien with the proceeds of the SBA but the balance needs to be minimal. 2. Loss on business tax returns or financial statements – Since the SBA relies heavily on a debt to income ratio (DTI). If the financial statements show a loss many SBA lenders will decline the deal. However, the good news is some things can be backed out of the tax return or financials to show a profit. 2 .a In many situations an owners salary can be backed out of a loss on financial statements to show net positive income. 2 .b In most situations depreciation can be added to the loss to try to remove the loss in the financial statements. 2.c Interest paid on existing loans can be backed out of financial statements to give your business a little more of a bottom line. Especially if those existing loans will be paid off with the SBA Loan. 3. Felony records – This is a borderline disqualification and depends what the charge was filed for. According to SBA policy, the SBA will not allow loans to a business whose owner is convicted of a crime of “Moral Turpitude.” Simply put – this is a crime that is related to a violent action or crime involving dishonesty. 4. Not being able to provide ownership of entity – Simply put the SBA wants to know who they are lending to. If you cannot prove who owns the company you will not be eligible. Now if you find yourself eligible based on the above-mentioned criteria it does not mean you automatically are approved for an SBA. This is just a starting point. As a business, you will now have to go through the application process. From start to finish most SBA loans that we have helped fund have taken 3 – 4 months from application to funding. b. Does borrower have affiliate companies? If so, see 6 above. b. How many current employees? How many after the loan? How many positions will be created as a result of the loan? The SBA has guidelines for startups and existing businesses that are separate. Yes, a startup can get an SBA loan – The process is a lot more involved and requires a variety of documentation in addition to standard SBA requirements mentioned above. 6. Operating in the US or approved US territory 7. Collateral “If required”. If you feel like your business does not qualify for SBA Funding don’t worry Excel is a leader in the Fintech space and has a variety of alternative funding solutions for small business owners. Not every business will need an SBA type loan and some might only need funding to fill a short-term need or just need emergency business loans without the waiting time. No matter the business we have the top SBA lenders with a solution for you!